There are four to a sheet of standard letter paper, so you can print as many copies as you need at home and simply cut along the dotted lines. Try placing the cards near your guest sign-in sheet next to a cute basket to drop them in, or pass them out when it’s time to play other shower games. Guests can make their predictions about the baby’s gender, birth date and time, weight and length, and hair and eye color just like they would online. Then you just collect the cards and add their predictions to your pool later (more on how to do that in this post). My own baby shower is coming up at the end of the month, and I’m excited to try these out. I think they’ll be handy for older guests who want to join my pool but aren’t computer-savvy (not to mention those busy friends who keep saying “Oh yeah, I need to do that!”). If you use them for your shower or gender reveal party, let us know what you think! Just leave a comment here or send us an e-mail. 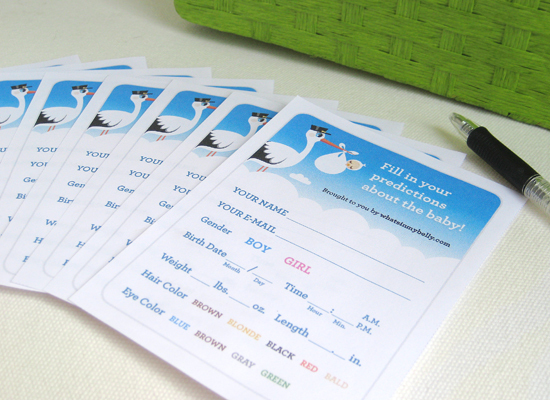 Download the printable baby shower guessing game cards. Mollee and her husband, Matt, live in Midlothian, Virginia, and are eagerly awaiting the arrival of their first baby (a girl!) in May 2013. (Check out her baby pool here.) Although she helps pay the bills as a graphic designer, Mollee’s true passion is for making things with her hands. Find more of her recipes, paintings and crafts at molleemade.com.